Airtel Nigeria, has announced additional benefits on its SmartConnect package, offering 100 percent value of a customer’s recharge as extra data in addition to the 8 times instant bonus customers get on every recharge. With the new SmartConnect package, Airtel customers will receive bonus data that is commensurate to the total value of their recharge at the end of a calendar month and also get eight times the value of every recharge, instantly, any time they recharge their lines. Airtel’s SmartConnect 4.0, which is nicknamed ‘Ovajara x8’, is the default prepaid plan specifically designed for new customers on the network. With SmartConnect 4.0, when a customer buys a new Sim, registers and inserts it in a device, he/she begins to enjoy the ‘Ovajara’ 8 times bonus and in addition gets the total value of his recharge as data bonus by end of the month. For instance, if a customer recharges with NGN 200, he/she gets NGN 200 in his main account and receives a bonus of NGN 500 for voice calls, N500 for data, with an additional NGN 200 airtime to call family & friends, and an extra bonus of NGN 200 for social (WhatsApp, Twitter, Facebook and BBM), which makes a total of NGN 1600 airtime on every NGN 200 recharge. As additional benefit, the customer then receives data bonus worth NGN200 at the end of the month. A recharge of NGN1000 gives NGN 2,500 bonus for calls to all networks, another NGN 2,500 bonus for data (500MB) and NGN 1000 airtime for calls to family & friends. Customers will also receive extra NGN 1000 airtime for access to social media. By the end of the month, data bonus of N1000 is given to the customer. The airtime in the main account will remain valid until exhausted while all bonuses have a seven-day validity. Customers can roll over all bonuses as long as they recharge within seven days else all unused bonuses will be lost. 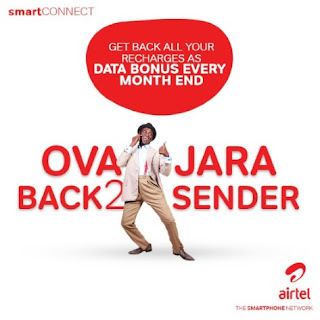 Subscribers only get the data bonus for the first three months, while the ‘Ovajara’ 8 times bonus continues. Any recharge less than N200 on SmartConnect 4.0 does not attract data bonus, which is given at the end of the month as total value of recharge, but enjoys only the ‘Ovajara’ 8 time bonus. Customers can dial *126*PIN# to recharge and dial*123# to check account balance. You need to grab an Airtel new sim now to start enjoying.